Our physical education teacher was able to get about 25 pedometers donated to our school as part of a data-gathering exercise challenge. He has handed off the pedometers to us teachers, asking that we record how many steps we take for each day, over four days, while in school. Later, the sixth graders in math will use the data in Excel spreadsheets to talk about mean, median and mode, I think. So, of course, this new pedometer strapped on my belt provided a nice morning activity. First, I asked the kids about the word “pedometer” and we broke the word down into its parts (root and suffix) and began making new words from “ped” and “-meter”, which dovetails nicely with our work in Language Arts this week around the Origins of Words. Then, I asked my students to estimate how many steps I would take before the end of the school day. I did give them a hint, as I had already been wearing the device for 30 minutes before they arrived. Some, not all, used that information to think about the hours of the school day and base their number on that information. We wrote all of the estimates down and in the afternoon, I announced my step count — roughly 4,000 steps — and we all cheered the winner. A lot of students asked when they can get a pedometer (that’s is phase two, I think). I’ll be putting the pedometer on again today as I teach. According to some websites that I found, approximately 2,000 steps equals a mile. That all depends on your foot size and your stride, but I am about a size 12 and I think I have a normal stride. I’ve been trying to learn some bass lines for a few songs that I am playing in an upcoming Benefit Concert (to get books for New Orleans and donations for Pennies for Peace). I am the bass player in a quickly-formed band that includes a colleague, a drummer, two former students (one on guitar and the other on vocals) and a daughter of a teacher at our school (we named the band after her since she has such a wonderful voice). I like the bass, but I haven’t played it much. Ever. It’s a whole different view of a song and I keep resisting the urge to get fancy. Keep it simple and keep it solid, I keep telling myself, and let the vocals be up front. I think my mindset as a sax player is to jump in front of the sound. And of course, hitting the right notes is always a good thing. The other day, guitarist Steve set up his portable recorder and grabbed these from practice. The concert is next week and we are hoping to get the crowd singing along with the Fireflies song. They certainly all know it — I hear the melody down the hallways. The third song we will be doing is an original song written by some former students, but we didn’t record it that day. The song is called Hourglass. 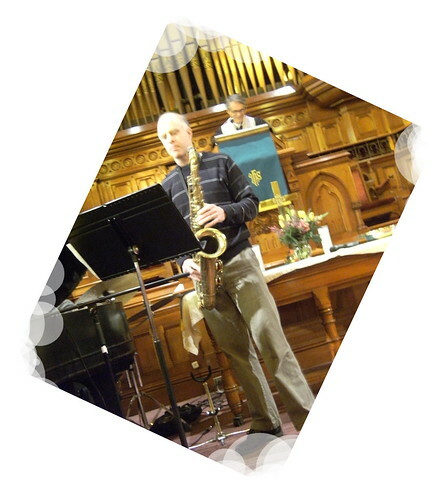 I wrote a few weeks ago about my invitation to play with some musicians of high caliber for a jazz-infused service at our church. I was nervous because I was out of my league with these guys. Yesterday morning was the service and, although I screwed up a few beginnings, I think I held my ground and kept up with the group as we made our way through about five songs, including God Bless the Child, When the Saints Go Marching In, A Child is Born and We Three Kings. I could feel that real intense concentration in my brain and I tried to remember where I needed to come in, what notes to transpose to the key of my saxophone, where to not play, where to play and more. I’m glad I did it but I am also glad that it is is over. Again, I am reminded of those student we put into a position of expectation but still need a support structure. We know they can do something, even if it right now beyond them, but we can’t just let them sink or swim. We need to be there to help. I would not have done as well as I did without guidance from our piano player, who gave me visual cues and coaxed me along in some of the songs. I looked to him for that help, even though I was on my own when the song began and my saxophone was in my hands. It helps, too, that our church is so supportive. You could not find a better audience. The best part? My wife is in the choir, and we got to stand near each other and play a few songs together when the jazz group provided the music for a few hymns.